There is not enough looking back on this website, but when the gates at The National Golf Links only open to the public once every hundred years or so, count me as one of the lucky few who hasn't forgotten the tremendous weekend that was the 2013 Walker Cup. A year removed the biennial match, the weekend still elicits fond memories of seeing elite golfers tackle America's most prized architectural work and the course that ignited a design revolution. 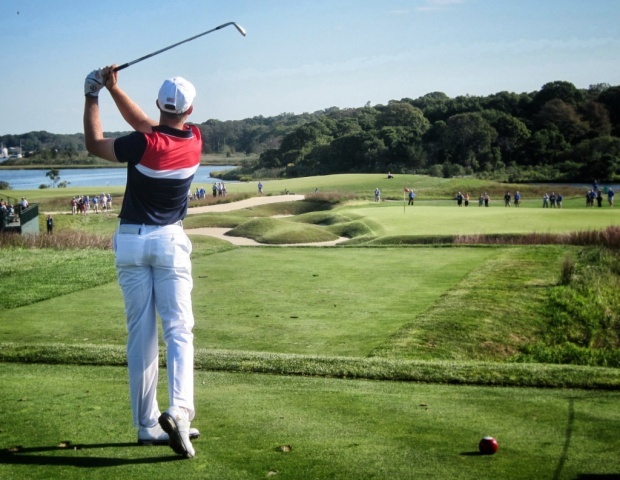 So if you're a new reader here or just want to see what all of the fuss is about, the photo galleries pages proves that the Walker Cup was played at The National Golf Links for the second time and it was a grand affair where I'm pretty sure a good time was had by all. Even the losing GB&I squad. Sunday singles and trophy ceremony. Those who were there still remember it, but for those who couldn't be at the Walker Cup, the USGA has posted all of George W. Bush's opening ceremony speech. Since it may be a while until we see a competition at The National Golf Links Of America again, I used the opportunity to take some panorama shots with the iPhone. This is the Redan, No. 4 viewed from the side (tee to the left) to show the slope from front to back. Golf Illustrated's R.E. Porter wrote a fantastic (and upbeat) account of the 1922 Walker Cup at The National Golf Links of America. But he did have "three regrets" worth noting for a variety of reasons, but especially considering the amazing flag-raising ceremony. First, the fact that the British captain, Robert Harris, was forced to forego the pleasure of playing as a member of the team owing to a sudden illness, although Bernard Darwin stepped manfully into the breach. Second, that the National Golf Links are so far from a metropolitan centre and that no provisions were made for the comfort or convenience of the vast golfing public that was undoubtedly interested. Some of those who had charge of the matches were perhaps unconsciously selfish or absent-minded in making the arrangements, and that brings me to the third regret, that there was no British flag flying from any flagstaff in courtesy to the visitors. It was a curious oversight in comparison to the flying of the Union Jack at the Engineers Club during the visit of the Canadian team and at Brookline during the National Amateur and to the flying of the Stars and Stripes at Hoylake last year when the American team visited the British Isles. Someone blundered, but who and why? It was strange how once again, in 2013, the flags of the countries involved disappeared during the competition, especially since The National Golf Links has one of the great flag poles in the world. And flying the USA, GB and Irish flags might have caused an enebriated boater to think he'd come upon the Irish coast, it would have been worth the risk to raise the flags above The National. Should The Walker Cup Be Played Over Three Days? Ryan Lavner explores a great topic which is likely not going to go anywhere because the organizations involved are so conservative, but it's still worth kicking around if you care about the Walker Cup competition. Three days instead of two? Unlike the Ryder Cup and Curtis Cup, the Walker Cup has never been played over three days. The format has changed over the years, however, and it currently calls for two days of double sessions: foursomes then singles. That’s a lot of high-stakes golf to cram into two days, and it leaves little time for the suspense to build, particularly before Sunday singles. With the U.S. leading 10-6 heading into the final session Sunday, the Americans had less than an hour to eat lunch and practice before heading right back onto the course. Some drama. While I never thing we need to add more days or prolong events in our sport that is already oversaturated, the pacing of the Presidents Cup should be noted in this discussion. It's just a better feel for everyone involved to play that one over four days instead of three (like the Ryder Cup). The same would happen with the Walker Cup if they opened with a flag raising ceremony, played foursomes. Then played singles Sunday (with all twenty players please) followed by the 36-hole day of foursomes and singles on Sunday. Since the USGA appears committed to taking this event to really special courses, selfishly two days is not enough to give the public a chance to eavesdrop on gems like National or LACC. A third day would not change the equation for the club except perhaps in making Thursday another day of shuttling spectators and manning concession stands. 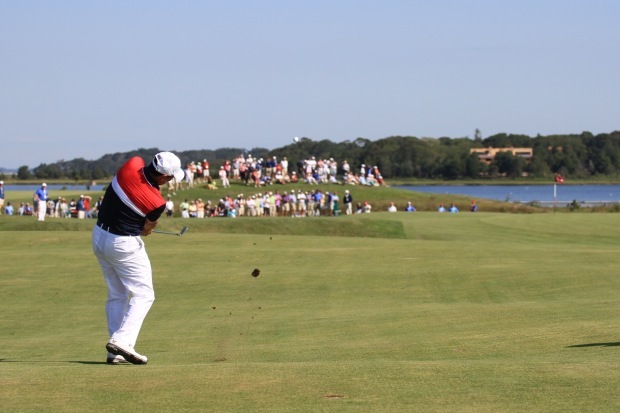 But if golf is the most important thing, a third day allows the players a better chance to perform and gives the event a better chance of being seen both in person and on television. 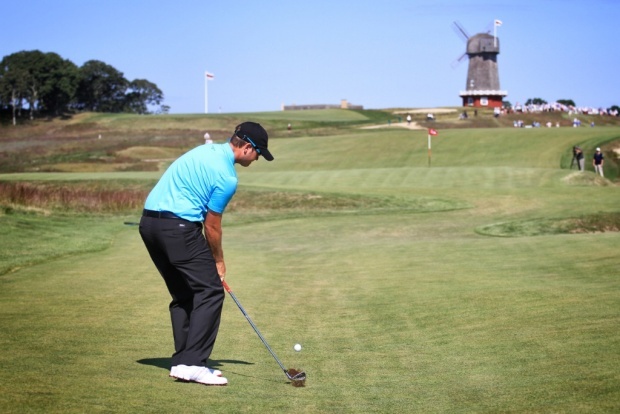 When you see a week so perfectly align as the Walker Cup at National Golf Links did, it gives a new appreciation to all that goes into making a successful championship. Even with bible of golf architecture in the glorious setting that is Southampton in September, the National exceeded all hopes and dreams as a venue. All four closely contested matches produced some fine golf as the U.S. split the session, holding on to a 10-6 lead heading into the ten singles matches. A late arriving crowd managed to shed their church wear in time to greet the matches as they made the closing stretch from the 14th on in. Excessively difficult hole locations for any format but especially for foursomes took away some of the Sunday morning fun but National continues to shine. 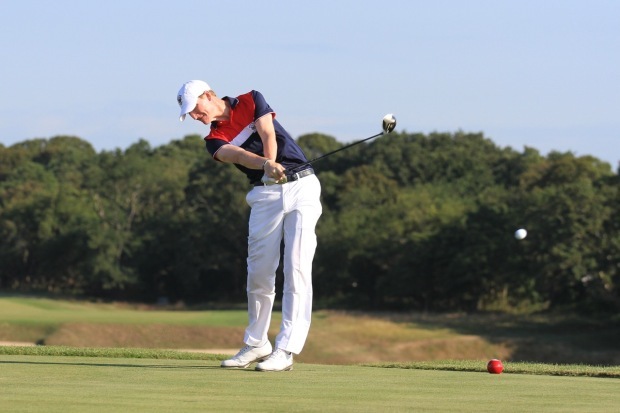 Ryan Herrington reports that the USA needs just 3.5 points to capture the Walker Cup. Just a magnificent day in all respects at The National Golf Links as the American's surged to an 8-4 lead following the afternoon singles. Judging by the Tweets I saw, the Golf Channel television coverage captured some of the brilliance that is National and the Walker Cup. Only there was not enough of it. Another two-hour window is delivered by Golf Channel Sunday from 4-6 PM ET. Walker Cup: GB&I "Here To Win," USA "Building Relationships"
Both teams and captains represented themselves beautifully in the pre-Walker Cup press conferences, but upon further probing there was definitely one huge difference. The National Golf Links of America put on a classy, once-in-a-lifetime flag raising ceremony on picture-perfect Southampton day overlooking Peconic Bay, and it was President George W. Bush, who made the occasion one to remember. Granted, as a former president whose great-grandfather created the event at hand so he has a bit more leeway in the speechmaking department. Still, it was Mr. Bush's levity, respect for history and sense of humility that brightened an otherwise bordering-on-somber ceremony to kick off the 44th Walker Cup. Perhaps had the remarks been televised "W" might not have been so glib, but thankfully those fortunate enough to have been there, we'll never know! Unfortunately, the entirety of his remarks are not on YouTube, and none of the much needed levity comes through. Still, Jessica Marksbury does host a short wrap up for YouTube. The USGA's official photos from the ceremony. Walker Cup: The National Is Ready To Go! Just 91 years later The National Golf Links of America makes a triumphant return to USGA golf with the 44th Walker Cup. 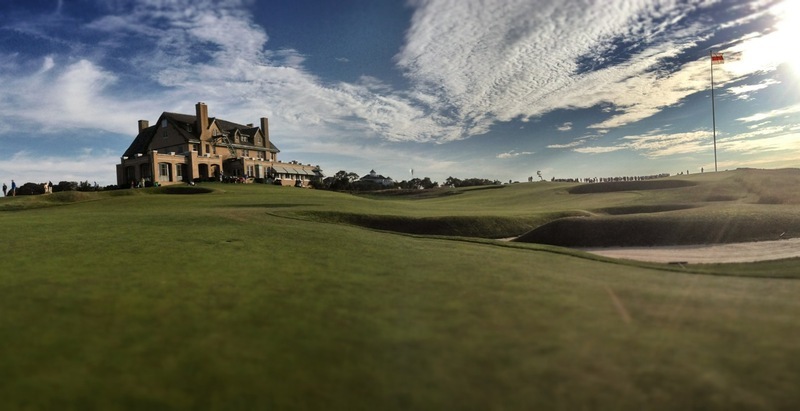 This is also the first chance to see arguably the most important golf course ever built. Golf Channel covers from 4-6 p.m. ET Saturday and Sunday. At least three inches of rain hit the course Tuesday and while it softened things a bit, the speed of the greens is just fine and any faster would be silly considering the contours. I can't wait to watch today's players take on C.B. Macdonald's masterpiece. Let the Walker Cup begin! Course creator C.B. 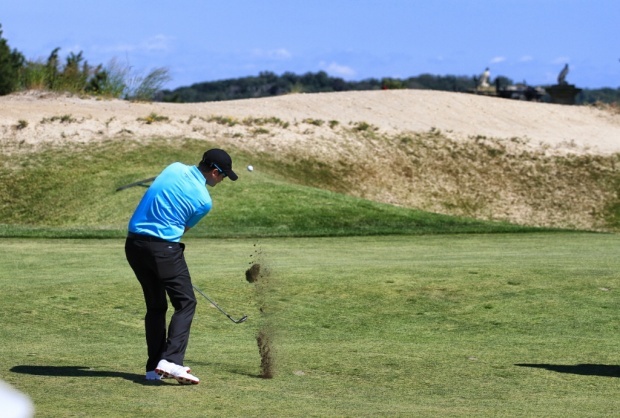 Macdonald was pretty high on his Sahara hole, National Golf Links' 2nd. The Sahara of the Royal St. George's at Sandwich I found in our second hole. In one sense it is not a replica, but it is a mental picture of that fine hole, embodying the underlying principle--a golfer's reward is granted to him who can negotiate the carry he is capable of accomplishing. The real carry on the line of the hole is over an immense bunker calling for 210 to 220 yards. The ball then can run to the putting green. Less powerful players must satisfy themselves with placing their ball from the tee advantageously to reach the green in two. I am confident that it is a much better hole than the original Sahara. Here are three short, very rough videos from the course looking at the Sahara, Alps back tee and the Punchbowl (16). Just a few shots from earlier today at The Walker Cup at The National Golf Links of America, more to come from the flag raising and rounds 1 and 2 this weekend. In preparing for the Walker Cup where I'll be reporting from Southampton for coverage at GeoffShackelford.com, Twitter and in Golf World, I went back through old Golf Illustrated and American Golfer magazines to read up on coverage of the 1922 match at The National Golf Links of America (an 8-4 win by the USA). I got a kick out of this from James Coxmenelton's "Current Comment" column in a September, 1922 Golf Illustrated. Following the Walker Cup matches and the National Amateur Championship, a writer in the London Daily Telegraph says as follows: "Personally I see nothing wrong with British golf. The plain truth is we don't make a business of it, and I sincerely hope we never shall. If we are to be beaten by a nation that a couple of decades ago did not possess a single first class player we shall take out licking like men. If the Americans in their pursuit of glory care to live on milk and fish, to eschew tobacco and go to bed at 10 o'clock, let them. I would rather see Tolley, Ray and Vardon blowing clouds of tobacco smoke around the links than with their mouths full of chewing gum." Fortunately for the rest of us, who have high admiration for British golfers and golf writers, this criticism is so narrow as to be ludicrous and cannot be taken seriously in any way. If by any chance, and I do not think that practices he mentions are as prevalent as he is inclined to believe, our boys do not smoke and drink, stay up after ten o'clock and chew gum rather than tobacco we should probably feel proud of the fact. Incidentally, neither Sweetser nor Evans, this year's finalists, smokes; but, for the most part, I would say our golfers smoke just as heavily as Britishers, the only difference being that the Britishers fancy pipes and Americans cigarettes. “Charlie Macdonald was determined to elevate the face of golf architecture in this country, and he did it in spectacular fashion." Damon Hack returns to his old craft of writing, calling up Ben Crenshaw to talk about The National Golf Links on the eve of the Walker Cup. I asked Crenshaw to compare it to its long-time neighbor, Shinnecock Hills, which will host the United States Open in 2018. Over the years it has become rote to describe the National as an ode to the great Scottish links, but Crenshaw believes that notion is a simplification. “Yes, a majority of the holes are replicas of famous holes overseas, but they have a touch of character that makes them play a little different,” he says. “You play the Alps hole, the 17th, at Prestwick and then you play the third hole at the National, you can see the features, but they are entirely different,” Crenshaw says. W Visits The Walker Cup! The 43rd president of the United States, George Walker Bush, visited the Walker Cup Thursday and judging by the glove on his left hand, teed it up with the USA squad. The event, named for his great grandfather George Herbert Walker, will witness a flag-raising ceremony Friday followed by rounds Saturday and Sunday (Golf Channel televises from 4-6 ET). **Julie Williams on the presidential visit. “He talked a lot about humility and not letting the fame get to us,” said Michael Kim of the U.S. team. After lunch, the Americans split into fivesomes and Bush laced up his golf shoes for a few quick holes. He played Nos. 1 and 2 with the first fivesome, Nos. 17 and 18 with the second. Fay: Without Walker Cup, "There would have been no Bobby Jones story as we've come to know it." A fun premise from David Fay in the September Golf Digest: if it weren't for the Walker Cup, where would Bobby Jones' record stand? According to the former USGA Executive Director, the Jones as we know him might not be the legend he became. When played in Great Britain in 1923, 1926 and 1930 (as well as its precursor, the International Match, at Hoylake in 1921), the Walker Cup was scheduled such that the British Amateur and the British Open were played around the same time. Jones took full advantage of bundling the three competitions in 1926 and 1930 by winning the British Open in both of these years as well as his only British Amateur title, in 1930. In 1923, Jones had planned to take advantage of the bundling approach, but Harvard denied his petition to be excused early from classes, so Jones declined his spot on the team. He remained in school and, later that summer, won his first U.S. Open title. During his competitive career, Jones made only one trip to Great Britain that wasn't in conjunction with a USGA-subsidized competition. That was in 1927, when he successfully defended his British Open title at the Old Course at St. Andrews—a course and a place he had come to love. He did not go for a third straight British Open title in 1928: Work and family obligations along with the steep costs of the trip were simply too much. The USGA's Mike Trostel touches on the life of National Golf Links of America visionary creator Charles Blair Macdonald. Luke Donald On The Walker Cup: "I think it's the pinnacle of amateur golf."